You’ve taken the key first step by bringing in a marketing automation platform, now more importantly is your second step…making it work and getting your maximum return. But marketing automation platforms aren’t simplistic to install, integrate, strategize or even execute. Rest assured, that’s where Reach Marketing comes in. We will help protect your investment and generate the greatest return possible. Now let’s get our Martech on! Below is our customized menu of services that will enable you to select the plan that best meet your unique needs and budget. We can also completely tailor particular options within these plans to completely customize your solution. Marketing Automation is an incredibly powerful tool if it’s set-up and used properly. To ensure your MAP is ready for success, we analyze your current platform structure. Our discovery and assessment process looks at your current system’s state of integration and optimization and allows us to identify the necessary steps to ensure its optimal use. Installation isn’t implementation. Buying your marketing automation software is just the beginning. We’ll ensure that you generate maximum return from your marketing automation platform. One of the most important steps you can take toward successful use is effective. We are the right partner to onboard your team and provide support throughout the process. Data management includes all the essential data hygiene and append services that ensure high data quality. With the fundamental package, you get better data and regular updates. Our advanced and enterprise choices also include data normalization and customer care that gives you deeper insight into your audience. Your MAP needs an audience, and this program provides ample access to it. Deliver your brand and marketing message to this exceptionally targeted and highly responsive audience of business professionals and residential spending decision makers. Choose your level of outreach and scale your lead prospecting to your business. Get noticed with leading-edge creative content and responsive design in your prospects’ web pages and in-boxes. Our creative design all-stars are ready to build responsive email, website, and landing page templates that let you generate fresh new campaigns quickly and easily. Target prospects when they are searching for your products and services through SEO/SEM offerings while getting the facts and figures on who’s engaging with you as part of our inbound lead generation program. Visitor and source tracking is part of our basic package, and enterprise investments also get a full range of SEO/SEM analytics to gain even more audience knowledge. We offer marketing automation management throughout the lead lifecycle from initial strategy development to testing to personalization. Nurture programs help prospects transition from new lead to a loyal buyer with our complete automation engine packages. If content is king, our content creation and engagement program gives you the keys to the castle with compelling blogs and newsletters, a strong social media presence, and in-depth white papers. Choose your level of content development from planning your editorial calendar to creating a complete content library that builds your industry authority. Data is more than numbers. It tells a story. With our marketing analytics program, your organization becomes the narrative’s main character. Learn about your audience, spot trends as they happen, and evaluate your successes so you can repeat them with improved analytics. Get your sales and marketing teams on the same page with a comprehensive sales and marketing solution that puts all your data in one central location. Sync your CRM with your marketing automation platform, or drill deeper by including complete sales/marketing integration strategies. 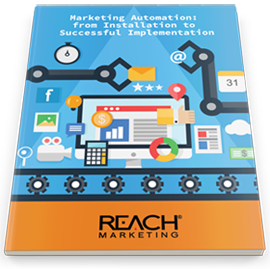 Launch your marketing automation system successfully and see faster, greater results.